Newly Renovated, with new tile, beds, furniture, carpet, etc. 1914 South Beach Club has wonderful views of the water from both larger bedrooms and the living room and kitchen. Steps away from twelve miles of sandy beach which begins close to the villa and goes up the Atlantic coast. Low density keeps the beaches from becoming crowded, even at the height of summer. Master bedroom has king bed and private balcony. The second bedroom has a king bed as well, with water views from the room. Second guest bedroom has a split king that housekeeping can form into two twin bed before your arrival with advanced notice. The kitchen is well appointed. Beach chairs are available. The condo comes with the Sea Pines amenity card. This card permits unlimited use of the Sea Pines Fitness Center, discounts on select Sea Pines restaurants, mainly in Harbor Town, discounts on golf. and two free hours per day of court time at the Sea Pines Racquet Club. In addition, arrangements have been made to provide an hour per day of court time at the South Beach Racquet Club, as well as a 15 percent discount on bicycles rented from the same. Two gate passes for the duration of your stay and departure cleaning is included in your quote. Villa comes with its own commercial-size washer/dryer. Dining room has a wet bar. Over 1,900 square feet in size. Will accommodate six with comfort. I have been coming to Hilton since 1976. South Beach is at the southernmost tip of Hilton Head Island, providing relaxation and privacy not afforded more busy locations. At the same time, other parts of Sea Pines are less than ten minutes away. Sea Pines is the premier resort on Hilton Head Island. The decisions governing land use, signage and density that were developed in 1955 before the first bridge was built, has served the island well today. No building is over five stories, giving Sea Pines and Hilton a sense of scale and density few other resorts match. toilet, shower, Shower is big enough for two people. Inside of Sea Pines, the island's premier resort. South Beach Marina Village located across street. Condo is beginning of five miles of private beach in Sea Pines up the Atlantic Ocean. Villa is where Caliobque Sound empties into the Atlantic Ocean. Lots of dolphins, etc. as a result. Bathroom towels provided. Beach towels are not. Amenity card entitles guests to unlimited use of Sea Pines Fitness Center, located on the way to Harbor Town. Built in oven and microwave. Have HD, HBO and sports package. Watch deer come by in the morning. Two balconies. One off of kitchen/living room, second off of master bedroom. Rent kayaks at South Beach Marina. Get two hours per day of tennis at Sea Pines Racquet Club in Harbor Town, plus one hour per day at the South Beach Racquet Club. Three golf courses in Sea Pines\, many others with different prices in other parts of the island and mainland. Prior notification needed to gain garage access, for disabled and owners. Pool for use by owners and renters only. Great spacious condo with wonderful water views. Located across the street fro The Salty Dog in Sea Pines, making it a great place for kids and adults. Nicely furnished, and the beds are comfortable as well. We would stay here again without issue. We enjoyed our stay in this condo very much. The views over the sound were beautiful. It ended up being cold while we were there for a post-Christmas vacation so we spent more time in the condo than expected and it was the perfect place to stay warm but be able to enjoy the views and watch the boats and dolphins. We did make it out on the beach some and it was an excellent beach front. The kitchen was very well equipped and we appreciated the quality of bedding provided. We also liked being in the Sea Pines area and so close to the South Marina and trolley stop. We would highly recommend a stay! Wonderful condo in great location. Well appointed, clean and comfortable. Lots of wildlife . Have never seen as many dolphins! Dolphins every time you looked out the window! Thank you. The dolphins are very much in evidence in front of the villa. This is where Caliboque Sound meets the Atlantic Ocean. Because the ocean currents here are not as strong as as the ocean proper, the dolphins are more likely to be seen here hunting for fish, as are the birds, from snowy egrets to sea gulls. The lesser currents are also better for swimming in the water, as there is less of an undertow. 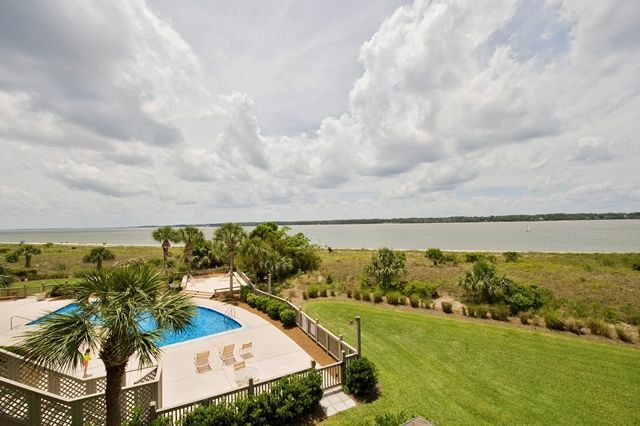 The Atlantic Ocean proper is less than 200 yards away as the beach goes up the Atlantic coast of Hilton Head, for those who want the full ocean effect. Overall very happy with our stay in Hilton Head. The place was nice, 3 bedroom, 3 bath. Small balcony to eat off from. Good size kitchen and living room. The pool was very nice to have, and the beach is very close (and very empty!). Lots of things to do on Hilton Head as well. Wish the drive to Savannah wasn't quite so far, but small price to pay. Grocery store only 12 minutes away as well, which is nice. A few very minor complaints (screen doors didn't work, there were no salt/pepper/oil/ items that everyone *could* share - i.e. that don't need a refrigerator, not enough dishwashing soap provided) - but they are minor complaints in the grand scheme of things. Highly recommend! I am so sorry access was difficult. I traced it to turnover at the front desk. It seems that someone had confused this property with another that did not have access codes. and did not put the access code into the check-in packet. I am glad everything else went well. I look forward to accommodating you on a future vacation.